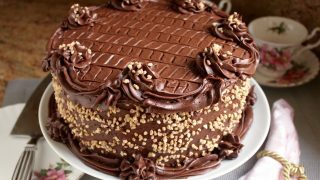 If you’re craving chocolate cake, why not make this super moist chocolate cake which is probably one of the best and most delicious you’ll ever taste? I was lucky enough to celebrate my birthday whilst I was in Rye (England) just over a year ago in October. I had stayed at The Mermaid Inn with my mother, the night before, which was something I’d wanted to do for many years. We had a gorgeous breakfast at the inn. 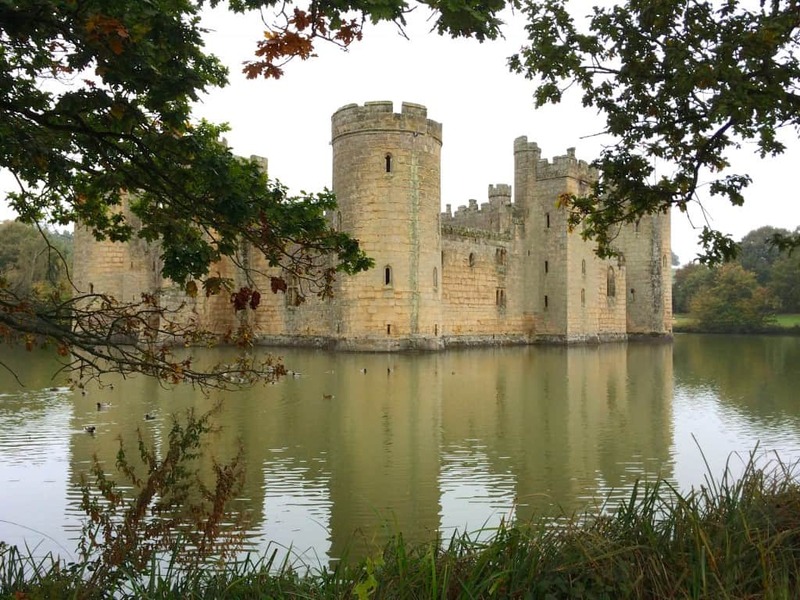 Afterwards, we picked up my Aunt Rosa and headed to Bodiam Castle, a National Trust property which we were able to visit for free with our Royal Oak Foundation memberships. I love Bodiam Castle, with its iconic moat! Afterwards, we met my cousins for a fabulous pub lunch; however, my cousin Denisa wouldn’t let me order dessert, which was quite strange. 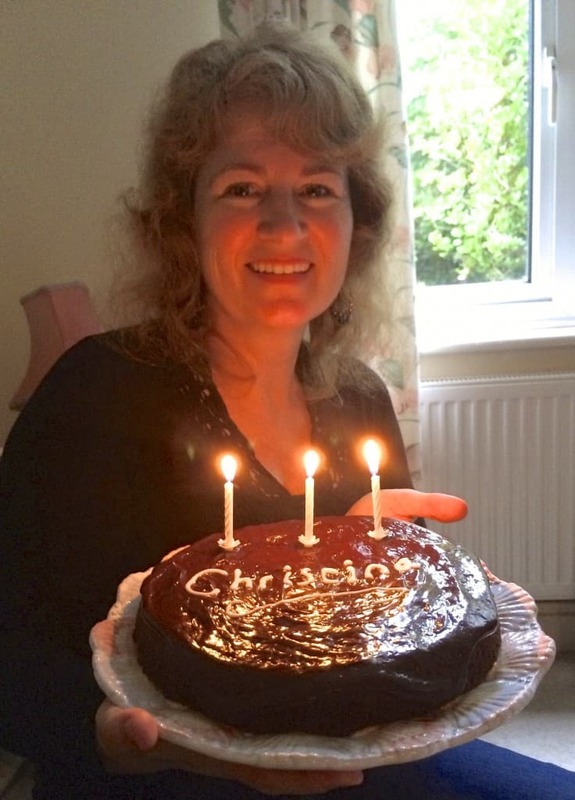 It all made sense when we headed back home, as she had a lovely, homemade birthday cake waiting for me! I was surprised, but not disappointed. Believe it or not, I dried my hair completely straight that morning, but this is the result of English weather in October on my hair. After the obligatory photos and candle-blowing, we all enjoyed a cup of tea with our slice of cake. I don’t remember who commented first, but someone complimented Denisa on her cake. It was such an incredibly delicious and moist chocolate cake; then someone else said the same thing, and we all ended up agreeing how fabulous it was. Yes, of course I asked for the recipe; actually no, I told Denisa I needed the recipe! She was smiling the entire time, but it wasn’t because of everyone’s compliments. It was because she had a secret ingredient: beetroot! We were all shocked. A healthier moist chocolate cake, that actually tastes better than a normal, vegetable-free chocolate cake? I’m in! I wanted to post this recipe a while ago as I’ve made it myself a few times, but it just hasn’t happened until now. I’ll convince myself (and maybe you too), that it’s the perfect moist chocolate cake recipe for the new year (the beginning of better choices and resolutions) because it’s so healthy and nutritious with the addition of beets and no added butter, if you want, right? Ha ha! 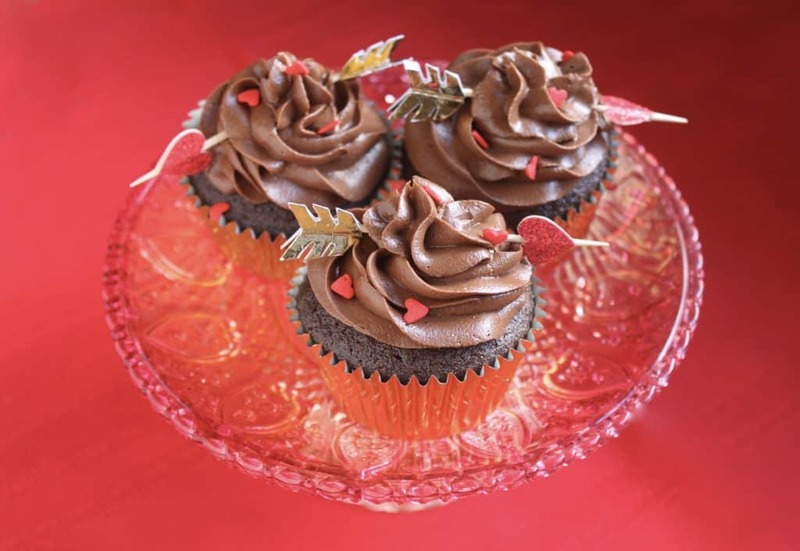 Want to make cupcakes instead? I’ve got you covered! Prepare two, 8″ or 9″ baking pans (or one, 9×13″); butter and flour them well. In a large bowl, place the dry ingredients, then add the pureed mixture. 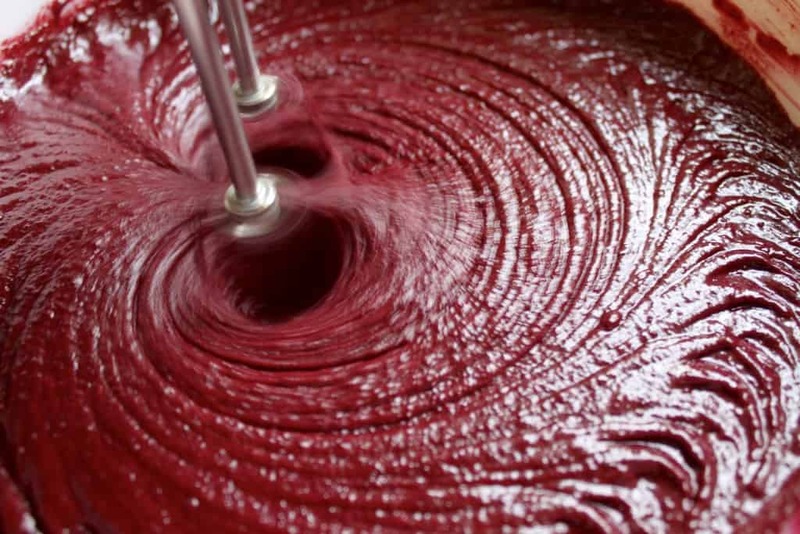 Beat with an electric or stand mixer on low speed until well combined. Pour batter into prepared pans and bake in preheated oven for 25 to 30 minutes, or until done a a tester (or skewer) comes out clean. Meanwhile, make the buttercream frosting by beating the butter until soft, then adding the sugar, cocoa, 1/4 cup (2 oz) coffee and salt, and mixing until creamy and smooth. Continue to add more coffee until a soft, spreadable, or pipable consistency is reached. Cut the tops off the cake to make them level, you can see photos on this post. Place one layer of the moist chocolate cake on a serving plate and spread some buttercream on top. All that’s left to do is to slice away! The Very Best, Most Delicious and Moist Chocolate Cake You'll Ever Taste (with a Surprise Ingredient: Beets)! 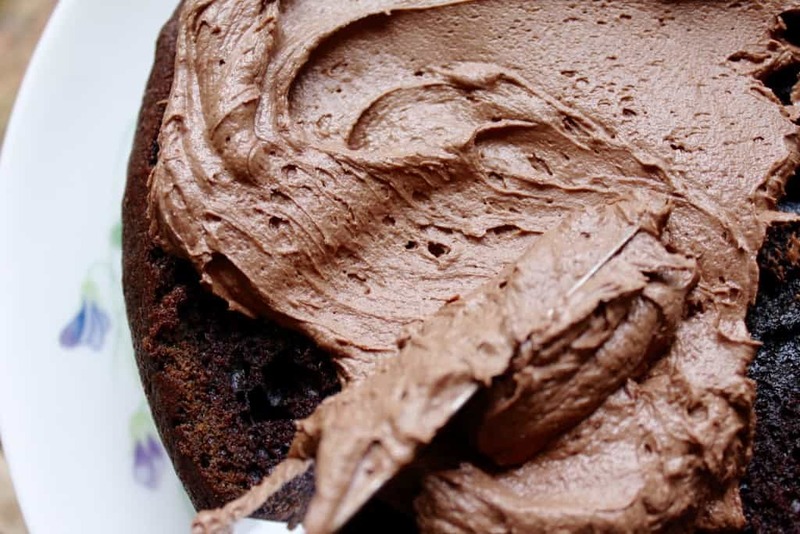 A super moist chocolate cake made with beetroot. 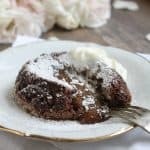 Ok, so I had an excess amount of beets in my garden and had heard about beets in chocolate cake – give it a try I thought! So as you do, I googled for a recipe and as luck would have it, the same lovely lady who has provided us with THE BEST DONUT RECIPE IN THE WORLD, had a post for a chocolate and beetroot cake. It only makes logical sense to trust in a recipe by Christina, if the donuts are anything to go by. Well, every word of the blog for this recipe is TRUE. My kids couldn’t even tell there were beets in it. 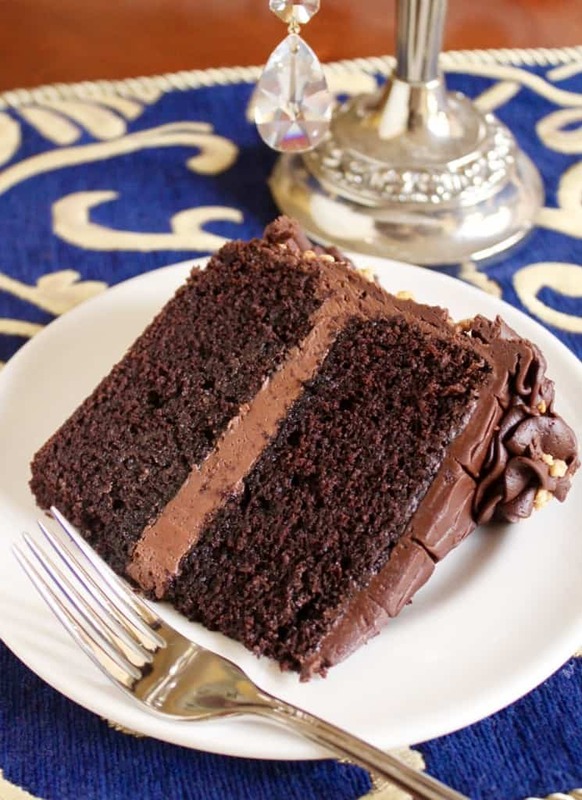 The texture of this cake is amazing – so light yet moist and so chocolatey without being sickening. 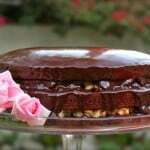 This recipe is by far the best chocolate cake recipe I’ve tried and beli ve me, I’ve tried many. 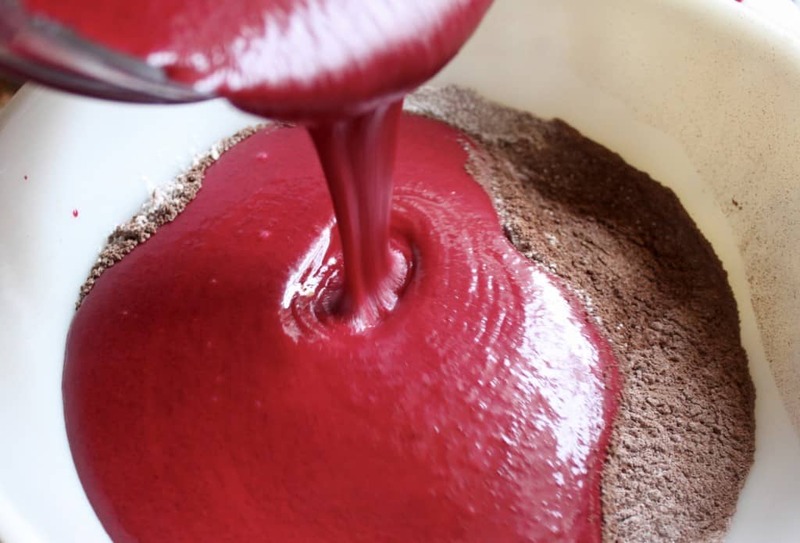 I’d imagine it would also be amazing for the basis of a Black Forest cake with its stunning colour. Christina, thanks so much for yet anther all time favourite. You really need to have your own Netflix show!! Well I will sleep soundly tonight after reading this, Anastasia!! What a lovely, lovely review! Neither one of the recipes are actually mine, but I do tweak and test and then share the recipes I love! Thank you so much for letting me know how much you and your family loved this cake. It’s so funny because my 3 year old niece is here for the weekend and I pulled this chocolate cake out of the freezer (it freezes beautifully, btw) and she LOVED it! As you said, no clue about the added nutrition with the beets! I made it gluten free using White Wings Gluten Free flour. The texture of the cake is superb. 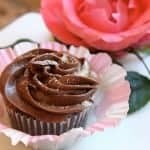 It is incredibly moist, rises like a dream and would have to be up there with some of the best gluten free cakes I have tried! I made this for my husband’s birthday last night, and he absolutely loved it! My kids and in-laws did too. The common comment was that it wasn’t too sweet. It was the perfect mix of the smooth chocolate cake, and a hint of coffee with a little kick of sweetness in the icing. I can’t wait to have it with tea this afternoon! For the cake it calls for 9T then an additional 9 T of coco…………..is that a misprint?? Going to make this just wanted to know. Oh goodness yes, misprint, Janet! Going to fix it now, I never noticed that and it’s so obvious! Thanks for catching it! My husband asks for beet cake every year for his birthday. It really is good and so moist. We use canola oil, to not take away from the wonderful chocolate flavor. 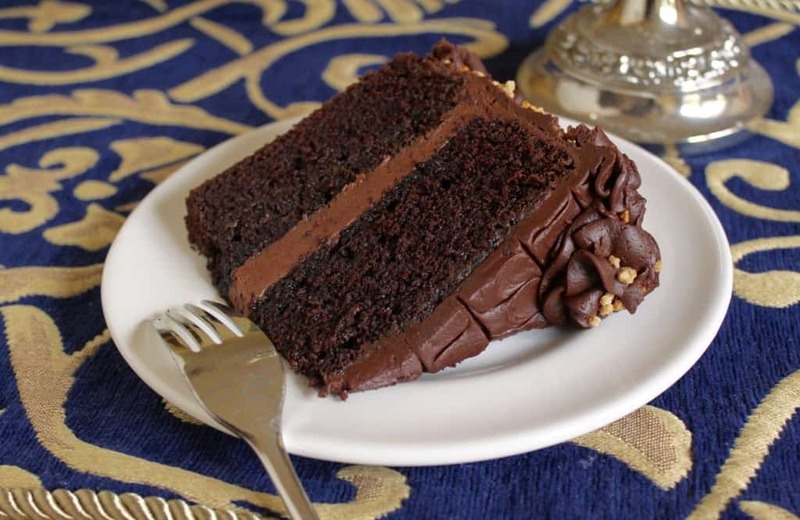 In my opinion, this is a much better alternative to red velvet cakes, with its rich, dark color. 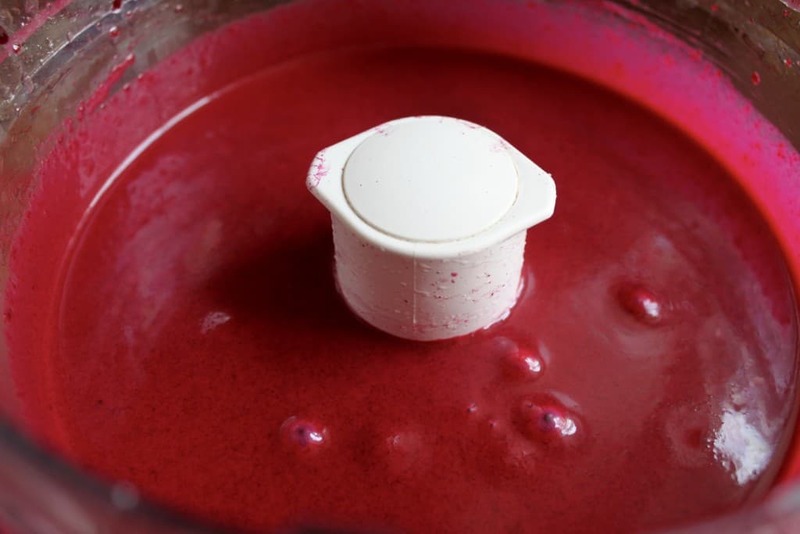 How much beet puree should I use, or does it matter? Can you give me an idea in cup size? GORGEOUS cake! Can’t wait to make it! Wow this cake looks so amazing! So chocoately! Thank you, Eden! It really is! Such a lovely and beautiful cake with a surprise! I love that you used beets, they are such a great addition to this recipes. It makes a difference, Fabiola! Give it a try! 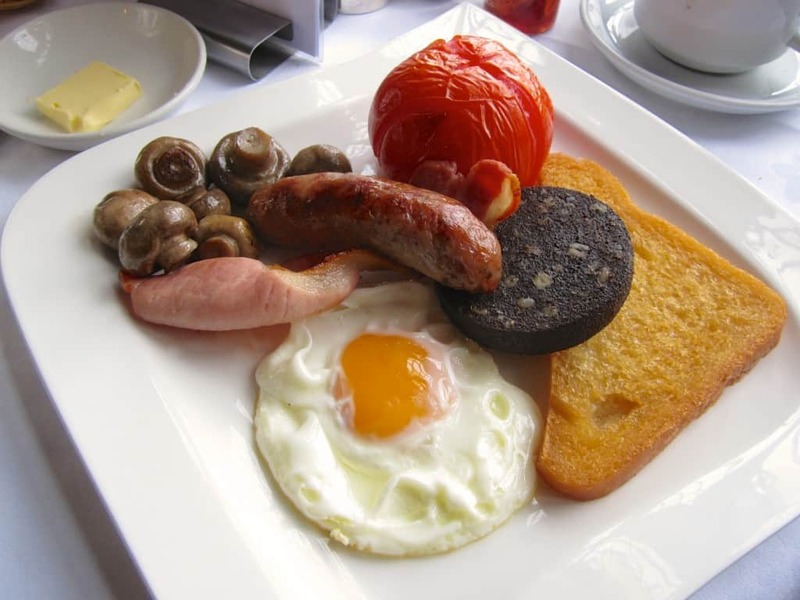 Sounds like a great birthday celebration — and I love those full on English breakfasts! Enjoyed quite a few of those while backpacking through England back in 2013. Looove that this cake has beets in it! Pinning! This is beautiful! I’ve never used beets in baking before, but the texture of this cake looks like pure perfection! I really need to try it! Your really should, Annie! Thanks!! Oh wow, the color and texture of this cake is amazing, I seriously cannot wait to try it! Love that it’s packed full of healthy fats, too instead of vegetable oil. Bodiam Castle looks incredible, by the way. I definitely need to visit someday. Yes, it’s definitely a keeper, Kimberly! I hope you can visit Bodiam one day; your kids would LOVE it! Made this for my husbands birthday . This cake is very moist , will be making it again. Whoa, you may have just turned me into a beet lover! Usually I hate them, but paired with chocolate?? Sign me up! This cake looks so moist and amazing. Oh yeah, you don’t even taste them in this cake, Elizabeth! Thank you for stopping by! I think cakes are healthy for the mind, and beetroots I am sure are good for the soul, so hurrah! Thanks for sharing to others! 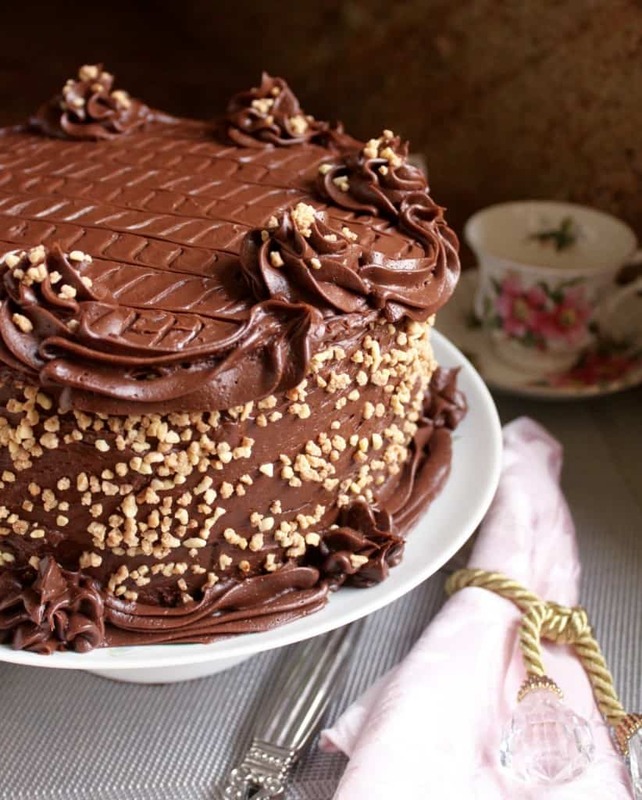 What a beautiful chocolate cake! I love the deepened flavor added by the beets! Exceptionally decorated too! 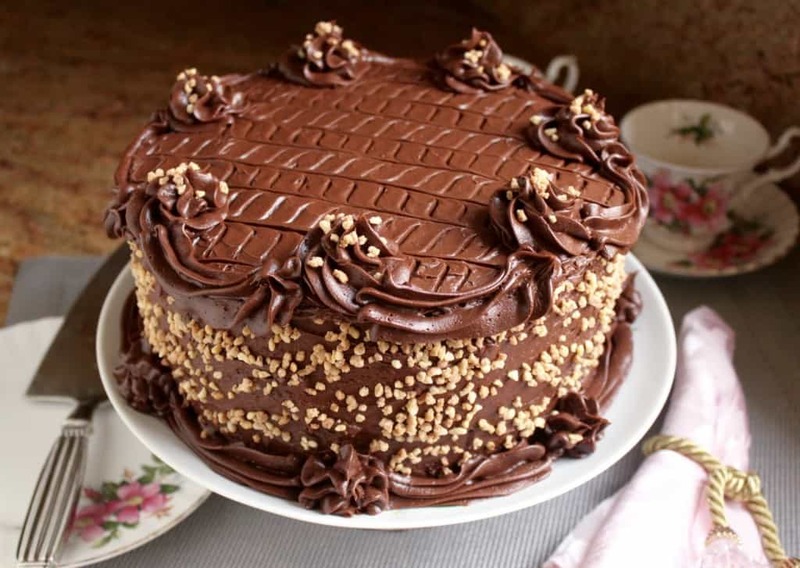 I can’t wait to make this cake and thank you for sharing the recipe. I’m glad that I just found you on Memorie de Angelina blog! Oh thank you, Roz! I’m so sorry I didn’t see this comment until now as this was sent into my spam folder, for some reason. You are very kind, and I’ve taken a peek at your lovely site, too! Gorgeous photos! I know we have a lot in common since we both follow Frank! Beautiful cake and I think that beets are such a great addition making the cake oh so moist. 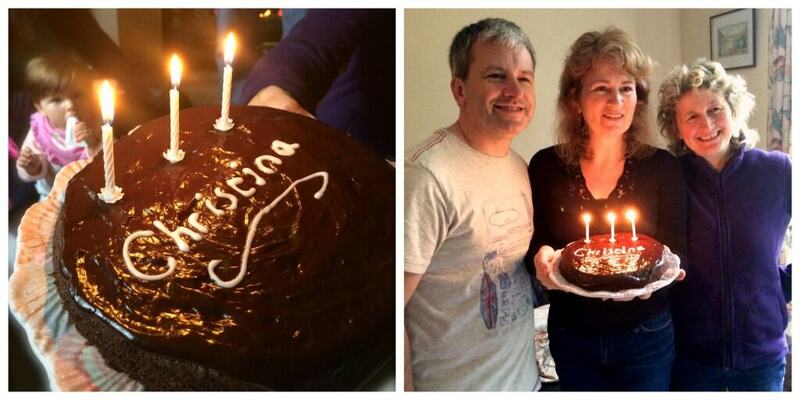 Your cake is really beautiful Christina. 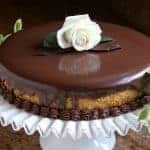 I have always wanted to try a chocolate cake with beets, I have always heard that they are incredibly moist and delicious. This is a good recipe to hold onto! Thanks, Andi! I hope you can try it one day, it’s really a treat! Well, it’s “mental healthy” at least! 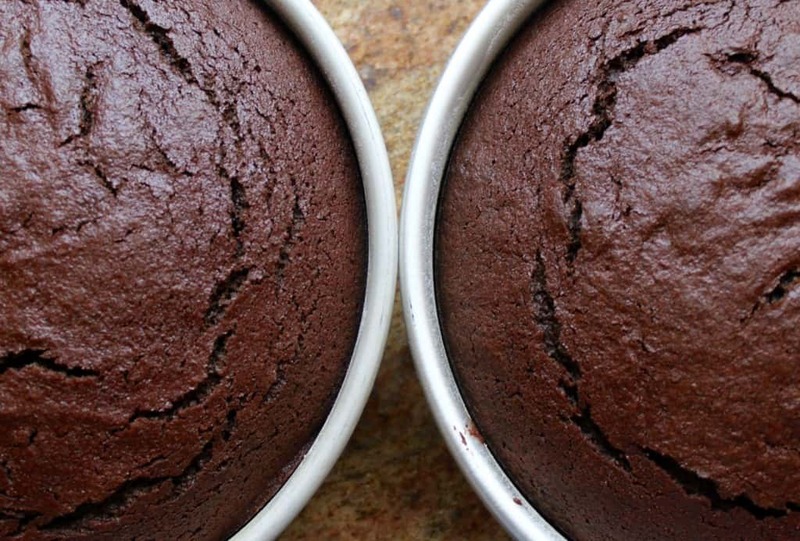 Looks wonderful and I have loved beets in my chocolate cakes since I was a kid! And Mayo. And zucchini! Bring it all on! 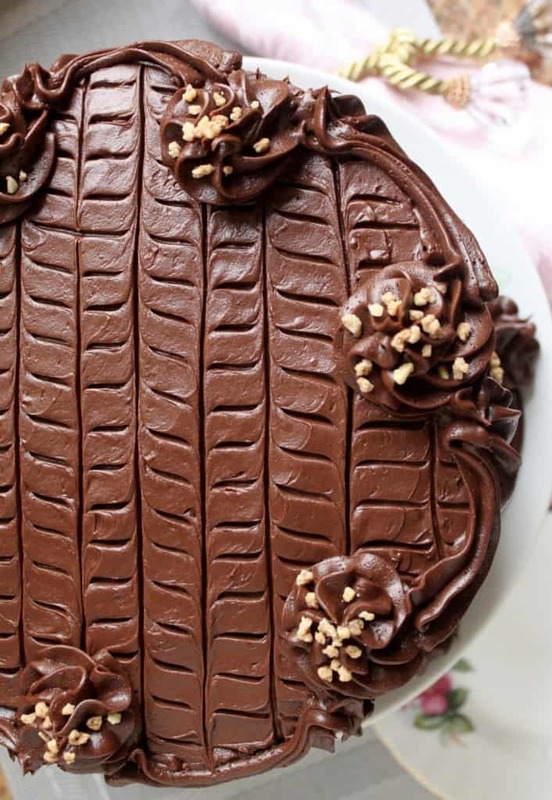 You know how to tempt us with the best moist chocolate, don’t you? Christina, this looks delicious and love the colour of the batter – or is that beeter ;-) ? I was going to say let’s put some beet and chocolate macarons on top but that would be OTT for such a perfect cake! Uh, ho… beets. The one foodstuff in the whole world I detest. And I’ve eaten things like deep fried ants and curried rat…. BUT I have to say, if there’s a recipe that might actually get me to enjoy them, this might be the one! Have to imagine the beets provide a kind of earthy background, not too noticeable on their own? Oh my, I am not a chocolate person, but you might convert me with this cake. Looks absolutely amazing! That’s funny, Lee! You remembered from the crab cakes! Please don’t big-up how virtuous this cake is. It contains well over two pounds of sugar and a huge amount of fat from the oil and butter. It may be delicious, but it is very far from being “healthy”, as you claim. Pete, my sarcasm has obviously been lost on you. I thought the “ha ha” made it clear, in case anyone thought I was being serious, but clearly it wasn’t enough. Sorry I wasn’t more transparent; I am not claiming this is a “healthy” cake at all.